Experiments with cobalt blue and white. Two half-white, half blue squares, swirled in the middle. Then blue lines on white, raked. 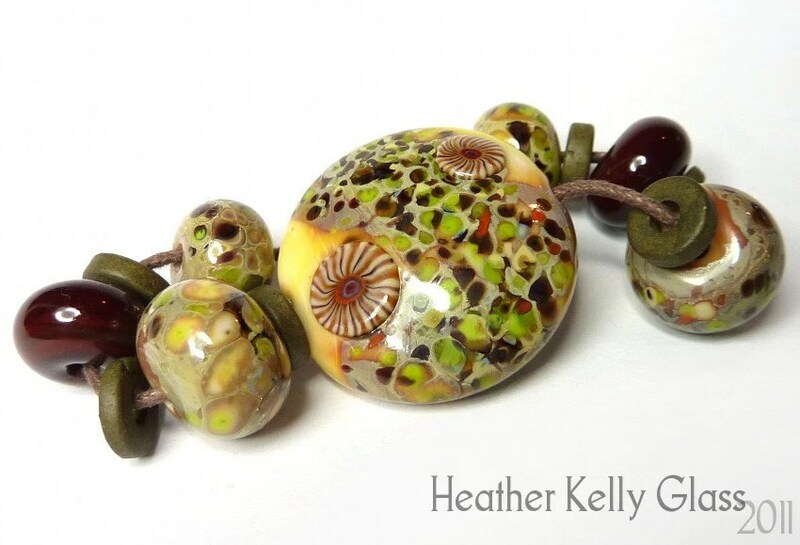 I kept squishing this one out of shape and had to keep adding more glass to the ends, which is why it’s rather bigger. It was also very tricky to get it vaguely smooth. 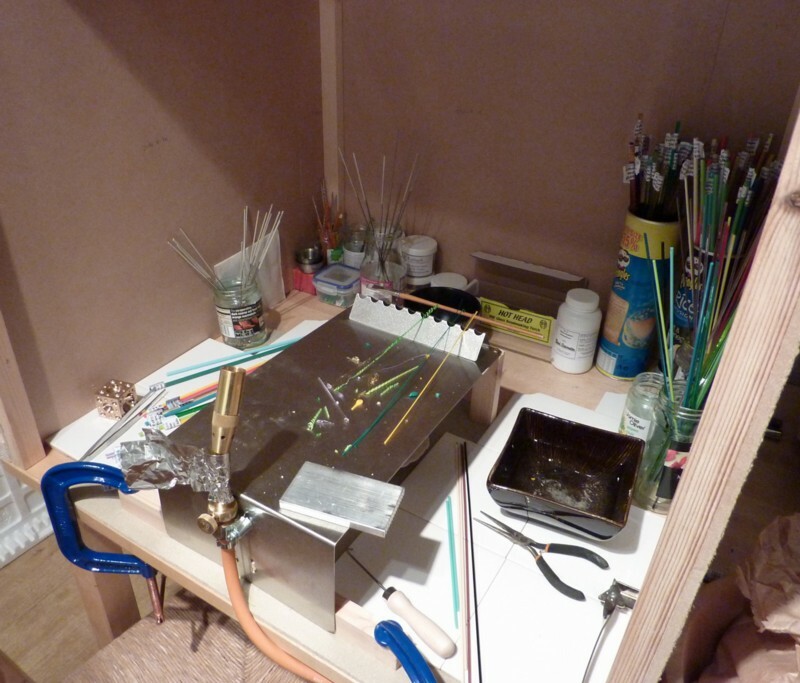 Next time, I should try it with a stiffer base glass than white! 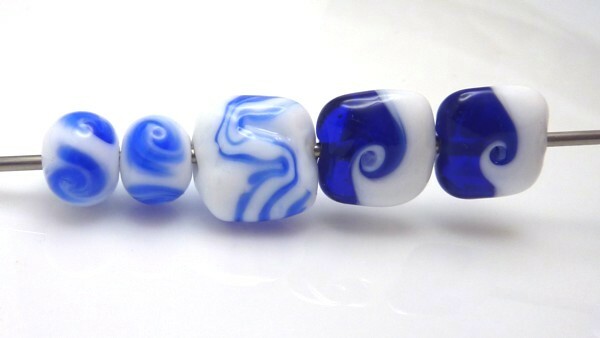 Last, I made a pair of white spacers with swirled blue dots. And that’s my week done! 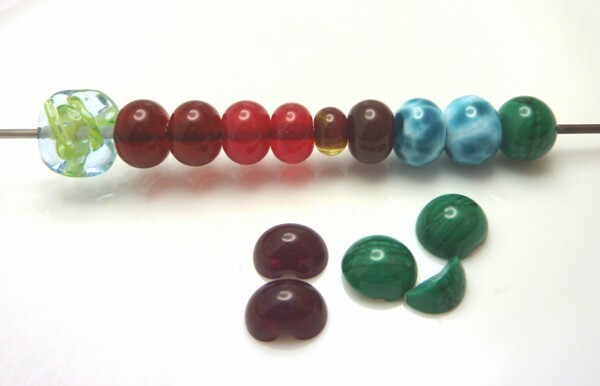 It’s been difficult keeping up with the photography and writing – I’ll be collecting my beads together to make larger less frequent posts from now on, I think! It’s been a very enjoyable week, though. More pairs of spacers, one broken fritty one. 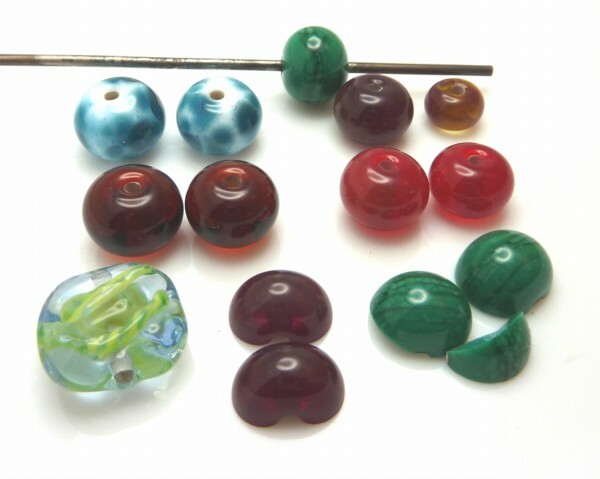 From now on I’m going to keep the two beads to a mandrel to plain spacers only, as I seem to have managed to keep them all warm enough this time. Mid purple transparent, purple opaque, petrol green (again), lime green, grass green transparent, then white rolled in aqua blue and aurora red frit. Another pressed square – pale blue transparent rolled in the aqua blue frit. It’s been really tricky to get the colour of the transparent purple right in this photo (and the reds in yesterday’s) so I’ve tried to adjust it so the bead colours are true even if the background’s gone slightly blue-tinted at the edges. It’s fairly accurate on my monitor at least now! Today I made pairs of spacers to practice getting everything properly round and to serve as a colour reference. 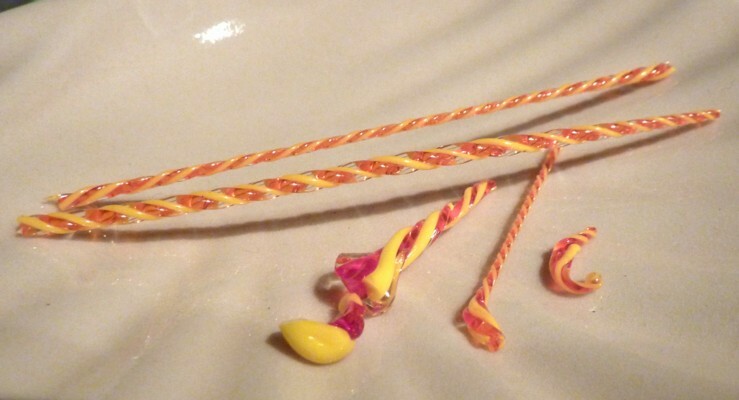 I was making them two to a mandrel… and I got my first stuck and broken beads. 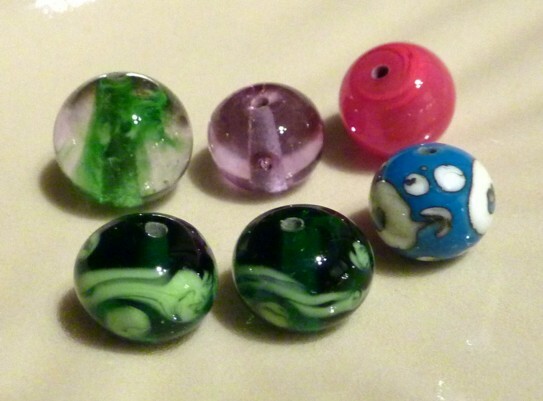 (I was pretty sure the stuck one was going to happen – the bead release broke as I was winding it on). It’s annoying they both happened with the petrol green, because I really love that colour. 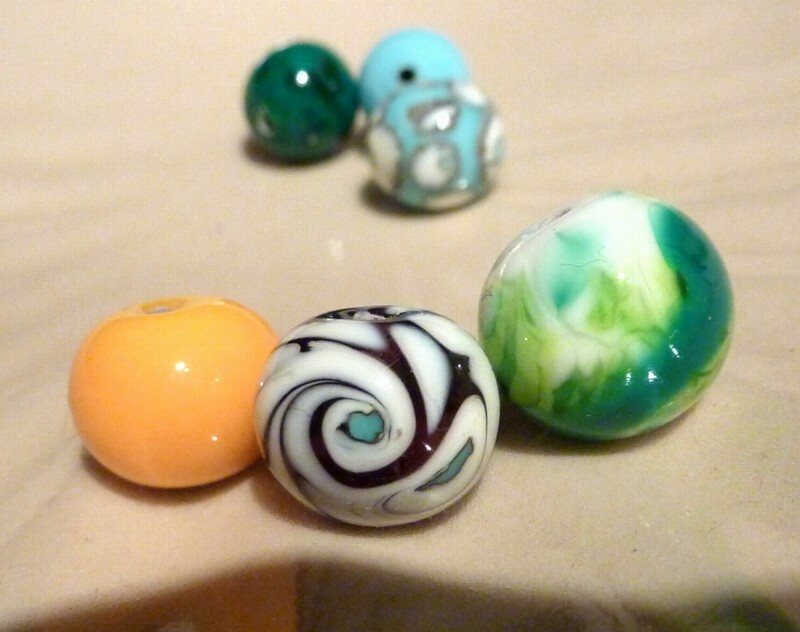 When I get a kiln I’m definitely going to try slumping the broken halves into cabochons. Here they’re all lined up after the stuck one. Petrol green, white with aqua blue frit, transparent red (the baby one is me winding off the end of my red twistie from that rod), transparent orange, dark amber. I assume I overstruck the red here… though it isn’t quite as brown in other lighting. Then the squarish one is me having a go with my Zoozii Mini Duo press. Pale blue transparent with two lines of green twistie on either side. (The photo is… not great though. Will have to try some other angles). 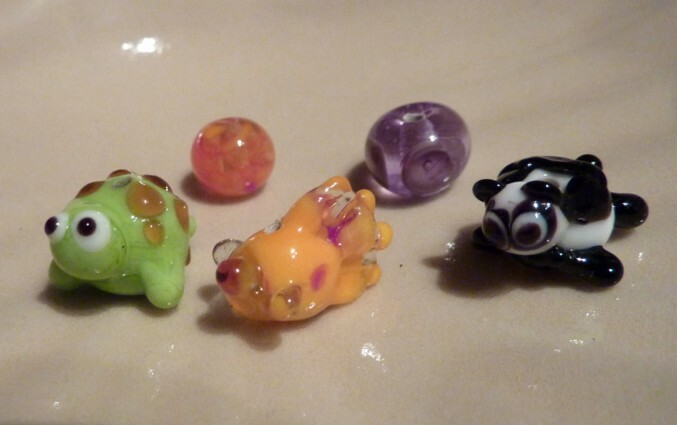 Newbie day 4 beads - critters! 1. Turtle. I made a base bead of opaque lime green, then added bumps for the head and legs, trying not to melt them right back in. I used dark amber transparent for the shell bumps, and white and black stringer for the eyes. I love this one, it came out just like I wanted. 2. Fish, on a request from my boyfriend. Base of opaque dark yellow, which I then used to pick up some little bits that had shot off my red twistie. Then I added a ridge of light amber transparent on opposite sides of the bead. I used my pliers to make one of these into the tail shape, and the other I melted down for the head. I added the fins and put s small amount of dark yellow on the ends of them and on the tail. The eyes are pale blue transparent and black stringer. 3. Panda. Kinda. I forgot how panda faces go so it ended up like this. White base, white head, black legs and tail, some more black on the back and neck, panda eyes! The eyes came out a bit huge because it was tricky to make them small enough after melting them down. 4. This is what I meant to do yesterday with the lilac bead. This time I used opaque purple for the plunged dots and they show up much better. 5. Gravity swirl take 2, with a base of light amber and alternating stripes of opaque red and dark yellow. Strictly, gravity-plus-pliers swirl, because after letting it sag I grabbed and pulled it round a bit more with the pliers. The colour worked better, though it’s a different kind of swirl from the first. I think Thursday’s going to be a day of rest, because we’re going out for a meal and I don’t think I’ll have much time to make anything afterwards. I also have to catch up with taking photographs and other admin-type things. I am really enjoying this week, but it’s not leaving me much time for anything else! I was on a roll this session! First, another twistie. It worked much better this time, though I still have a rather thick piece at the start of the pull, and I’d have liked to be able to pull a section twice as long as the ones I managed here. Definite improvement though! I followed this by pulling a couple of transparent green stringers – still very thin. 1. Dark green transparent base, with a wavy line and dots from the piece of my green twistie that was mostly lime green and transparent. Then I made another the same on the same mandrel, to see if I could. 2. Transparent lilac base, with plunged dots of transparent mid purple with a little more lilac to cover the dots. Hmm. You can hardly see the purple at all, though you can see the bubbles. I think I should have used an opaque purple instead for the dots. 3. 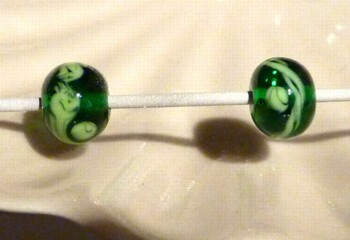 The larger clear wispy green bead. I made this by attaching the thick end piece of my green twistie to the rod of clear and using that to make the base bead, then adding more clear over the top. It’s interesting, and you can see little green wisps inside, though I think I should actually have added more layers of twistie in it to give it more going on. I’ll try that another day. 4. Transparent orange base with opaque light red dots, gravity swirled. I like the effect and I will be trying this again with colours that contrast better! Possibly with stripes rather than dots to start with. This one has a tendency to photograph pink when it isn’t really. Green: rod of pale blue transparent, stripes of lime green opaque and dark green transparent. Red: rod of transparent red, stripes of light amber and medium lemon yellow. I started this session by trying to pull stringers… with not much success! I have some verrry thin ones now. Then I tried to make a twistie, and that really didn’t go well! I wasn’t managing to pull more than an inch or two at a time at any decent thickness. So I tried pulling a bit, heating the next part, pulling again, but mostly that just broke off the part I’d already made, leaving me with lots of little ends. And one mutant variable-thickness twistie that will probably be rather hard to use. More practice needed! I think with both the twistie and the stringers i wasn’t managing to heat a large enough gather at once before pulling. 1. Dark yellow. I really like the colour of this, it’s very cheery! 2. Mid purple transparent base with light ivory dots, swirled with a light turquoise stringer. I picked up the light ivory thinking it was white. Oops! I’ve since separated out my commercial stringers a bit more so it’s easier to tell them apart while wearing diddys. Not that it makes a huge amount of difference here, it just gives me the thin reaction line round the turquoise. I think I added a bit too much ivory for the effect I was going for, though you can still see the base is transparent in person. 3. White base with melted in little bits of my twistie detritus. 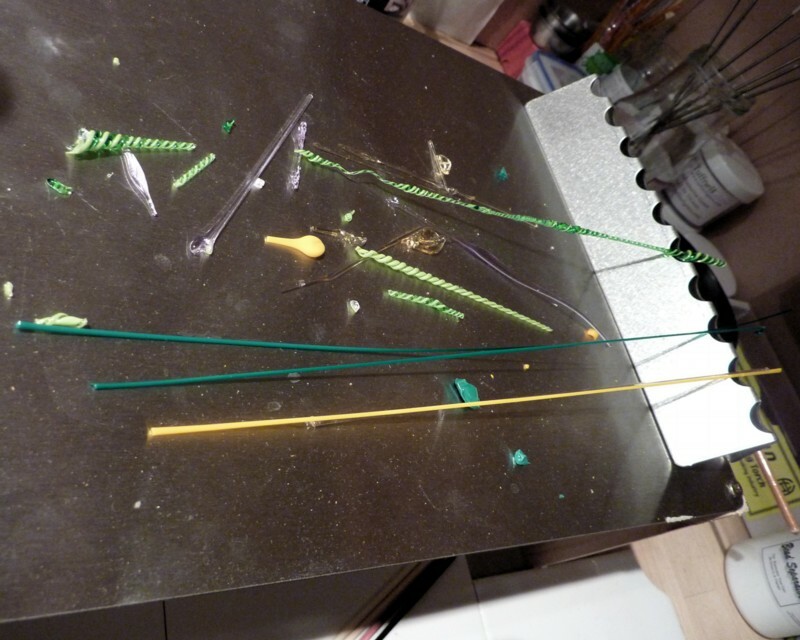 I then somewhat ruined it by adding a wavy line of petroleum green from one of my very thin stringers. Not so thin anymore as it spread a lot more than I was expecting. Oh well. I also had to reshape this bead several times as I was working on it, because I kept melting the base out of shape while adding the twistie. Whups. Quick recap: I’m using a Hot Head torch with a bulk connection kit so that it can be run off a normal propane bottle. Otherwise you have to use the little canisters of Mapp gas that are very expensive and run out quickly. I didn’t bother even trying to use those. 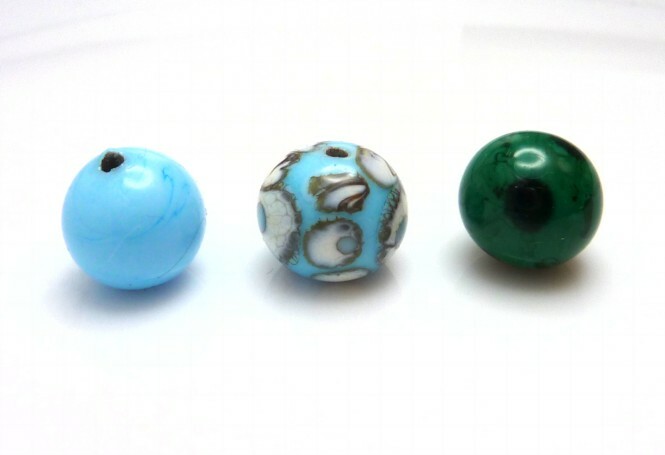 In my first session, I made three little beads! End shapes not wonderful, but I was having shaky hands from nerves/excitement for a while there! I was surprised by the lacy effect round the edge of the ivory, so asked on Frit-Happens if I’d been overheating it. Turns out, my stringer was dark ivory and that’s the effect you get with it (light ivory gives the smooth outlines that I was expecting). It looks a lot better than I think light ivory dots would, because I was still jittering and trying to find the right place in the flame, so the dots were a bit all over the place anyway! I knew that dark ivory reacted more with silver, for example, but I didn’t know it did this! Rather cool. I’m pleased I didn’t accidentally reduce my turquoise and get rusty spots all over it, too.